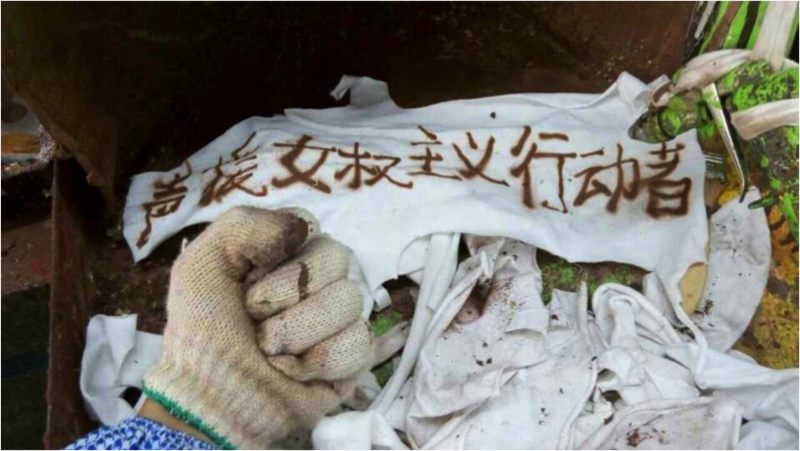 Translation of a statement by the partner of "Da Tu" (Giant Rabbit), one of the feminists detained on March 7, focusing on mutual aid between feminists and workers, with solidarity photos workers have posted online. Followed by translation of a petition by students at Da Tu's alma mater, Sun Yat-sen University (one of many petitions circulating in China, despite censorship). "When you're in a battle against an enemy so much bigger, so much stronger than you, to find out you had a friend you never knew existed, that's the best feeling in the world." This was said in the movie Pride, when a leader of Welsh striking miners expressed gratitude to London gays and lesbians who donated to the strike. It is based on an actual speech from 1984. And it also reflects my own feelings today. In the early morning of March 7th, several women's rights activists in Beijing, Guangzhou, Hangzhou and Yunnan, including my girlfriend Zheng Churan (郑楚然) -- known as “Da Tu” (Giant Rabbit) -- were taken away by police. In honor of International Women's Day, they had planned to organize activities that day advocating the establishment of mechanisms to prevent sexual harassment on public transportation. Up to today (March 10th), five activists including Li Maizi (李麦子), Wei Tingting (韦婷婷), Wang Man (王曼), Da Tu and Wu Rongrong (武嵘嵘), have not been released. It is very likely that they have been kept in detention at the Beijing Haidian Police Station. On March 8th, I saw photos in which many friends from at least Seattle, London and New York were holding the anti-harassment posters made by Da Tu and others, or signs of "Feminist Activists", or stickers with words in Chinese "Advocating Women's Rights Is Not a Crime" (女权无罪), in support and solidarity with these detained women's rights activists in China. At that time, what I felt was exactly "the best feeling in the world". Fortunately, this was not the first time for me to feel this way. I had the same "best feeling" on September 26th, 2012. During that year our Shenzhen labor NGOs were all repressed by the authorities. On that day, women's rights activists from Guangzhou visited our fellow workers with 102 mooncakes they made, and we had a difficult but cheerful Mid-Autumn Day together. That was the most timely help and support! In fact, women's rights activists like Da Tu have always supported the rights and interests of workers, and not only female workers. 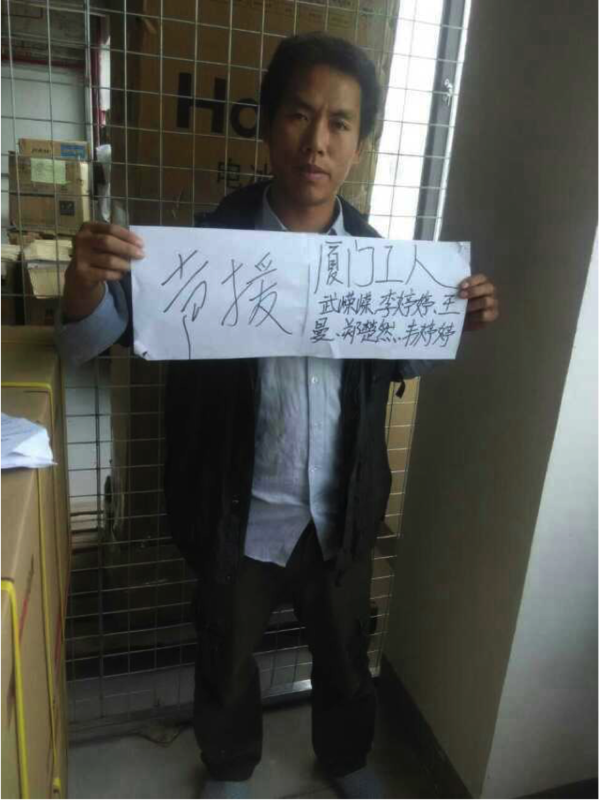 For instance, when, Wu Guijun, the worker representative from Diweixin factory, was detained in 2013, Da Tu actively supported Brother Wu. 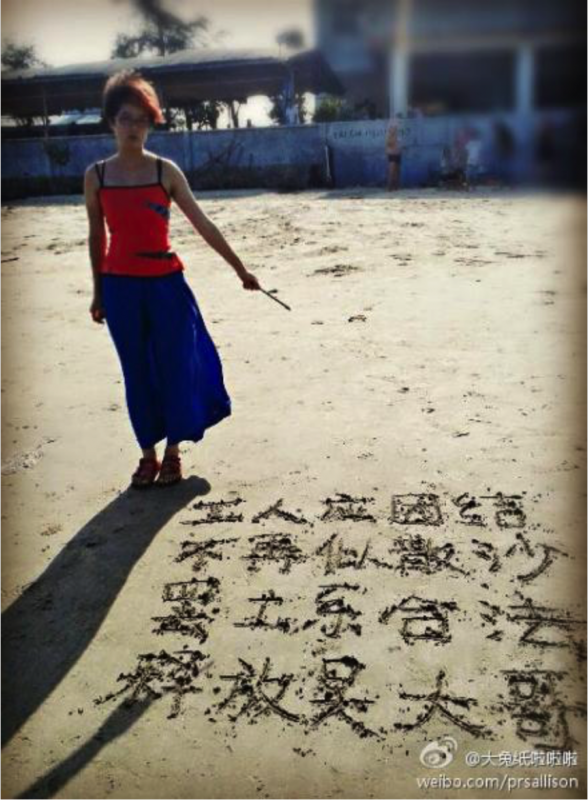 Photo of Da Tu, in which the Chinese words read "Workers should unite, no more like loose sand! Striking is legal! Release Brother Wu!" On November 25th 2013, Shenzhen Hand in Hand Workers Center (手牵手工友活动室) published survey result son female factory workers suffering sexual harassment, as well as a video which was shot and edited mainly by Da Tu. 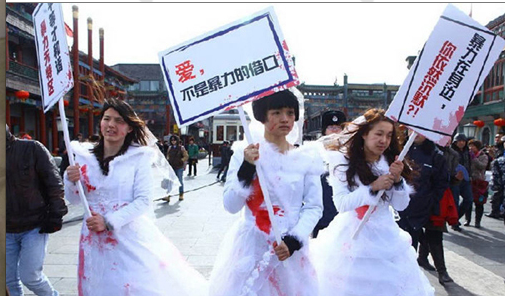 During the sanitation workers' strike in Guangzhou University Town in 2014, Da Tu was on the spot and later wrote, from a gender perspective, a news report "Look! Women are Fighting!" It reflected the subjectivity of female workers in this strike, inspiring and encouraging all workers, and smashed the stereotype of always men-dominated strikes in the minds of outsiders. Women's rights activists like Da Tu have always paid close attention to workers' rights and interests. Therefore, it is not surprising that when they are kept in detention, workers come with their support and solidarity. 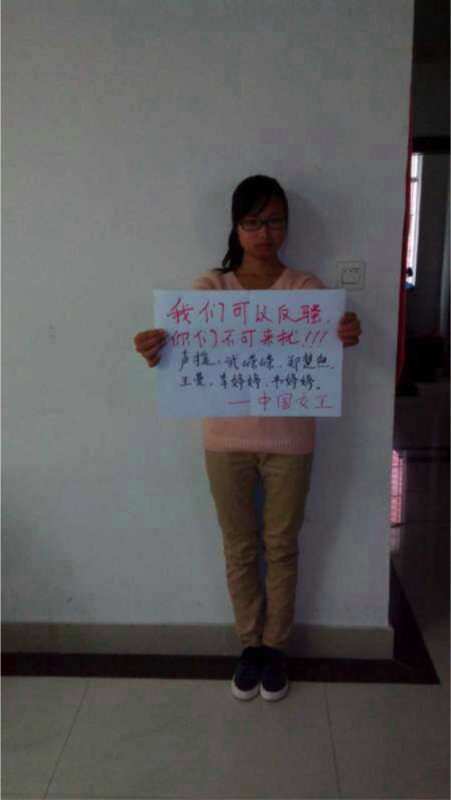 Many warmhearted workers from Xiamen expressed their support for these five detained activists with photos. 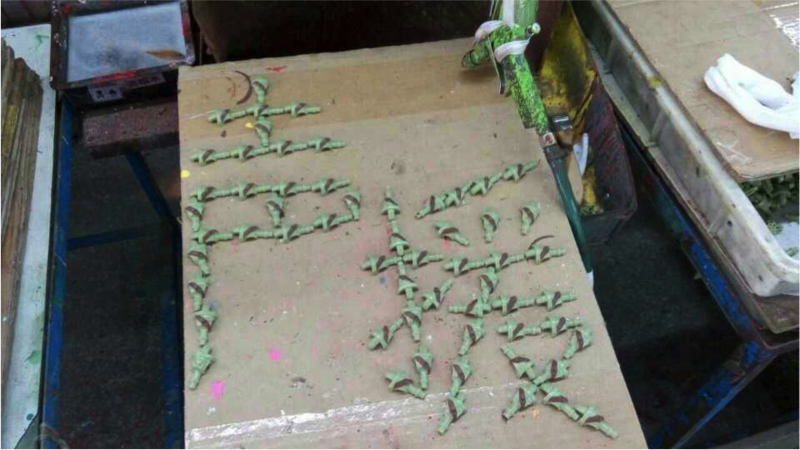 "Xiamen Workers in Support of Wu Rongrong, Li Tingting, Wang Man, Zheng Churan and Wei Tingting!" "Support Women's Rights Activists!" Was this slogan written by a fellow worker with rust or motor oil? Seeing her worn-out glove, I felt sad but also deeply grateful. One female worker holding the poster "We Can Fight Against Sexual Harassment! You Should NOT Disturb!" Some friends have commented, "I have never been so awakened!" "Da Tu, PRIDE for you!" "The proletariat supports you!" In the history of the labor movement, more than a few achievements have been earned by working and fighting together with women's rights activists. For example, International Women's Day was initiated from early struggles to reduce hours, increase wages, improve working conditions and prohibit child labor. The plight of women's rights activists derives from both patriarchy and class oppression. Under the shadow of these problems, none of us can evade, or yield. Instead, we should continue exploring the road to proceed, lending hands to others and then holding firmly together. Since the night of March 6th, several women's rights activists in Beijing, Guangzhou, Hangzhou and elsewhere, including SYSU alumna Zheng Churan, have been detained by police. The past celebration of International Women's Day witnessed not only best wishes and some cheerful events for women, but also the discussion of feminism. As a matter of fact, topics about feminism and anti-discrimination have initiated and gradually circulated since this year's CCTV Spring Festival Gala. Though it has yet to be a society-wide discussion, it is inspiring and encouraging enough. Any social reform necessarily takes time, but it has to start from an awakened mass in realizing the existence of problems. However, since the night of March 6th, women's rights activists in Beijing, Guangzhou and Hangzhou have been detained by police. These activists had previously organized campaigns such as advocating equal university entrance for men and women, and the provision of more public toilets for women. They had planned to distribute stickers printed with sentences against sexual harassment on public transportation and advocate the establishment of mechanisms to prevent sexual harassment on public transportation. The news of their arrests, shortly after appearing on China's Weibo, was blocked and prohibited from forwarding. According to lawyer Yan Xin who represents women's rights activists, Xu Ting and Yu Lian was freed by March 9th. Zheng Churan (known as "Da Tu"), despite being in detention, has been allowed to make phone calls. However, Li Tingting, Wei Tingting and Wang Man are still out of contact. It is possible that they have been kept in detention. 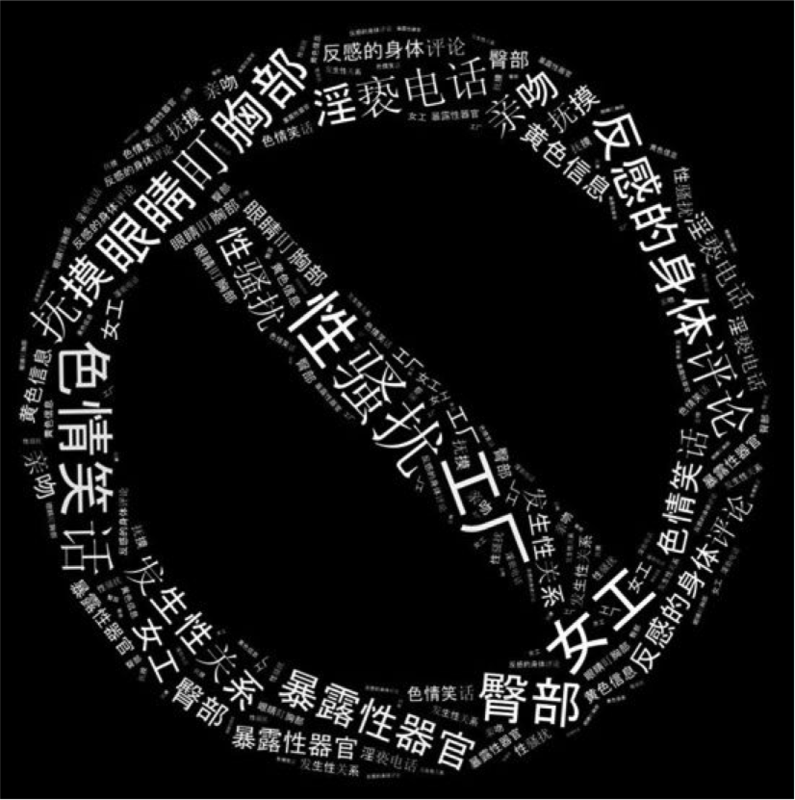 On March 7th, the day before International Women's Day, several women's rights activists in Beijing, Guangzhou, Wuhan and other cities were detained by Beijing police under the allegation of "Picking Quarrels and Making Trouble" [寻衅滋事] due to their plan to organize activities against sexual harassment on public transportation. Among the detainees is Zheng Churan, who graduated from SYSU with a double major in Sociology and Archival Science in 2012. 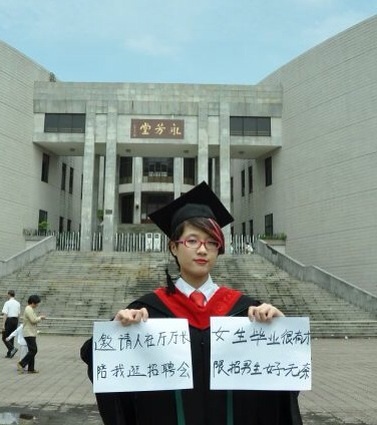 When Zheng Churan was still a student, she initiated campaigns such as "Occupy Men's Toilets" and "No Sexual Harassment, No Domestic Violence" in Guangzhou. She also wrote letters to CEOs in China's top 500 enterprises, advocating the elimination of employment discrimination against women. After graduation, as a feminist activist, she continued to fight against gender discrimination against women and strive for equal rights and status for women. She is a contemporary pioneer in the movement of promoting gender equality. Without any legal procedure, Zheng Churan was taken away by Guangzhou and Beijing police late at night on March 6th and kept for interrogation for more than ten hours. Her apartment was searched. She was brought to Beijing on the next day and detained in the Beijing Haidian Police Station. As students and alumni of SYSU, we admire Zheng Churan's contribution to women's rights in China. 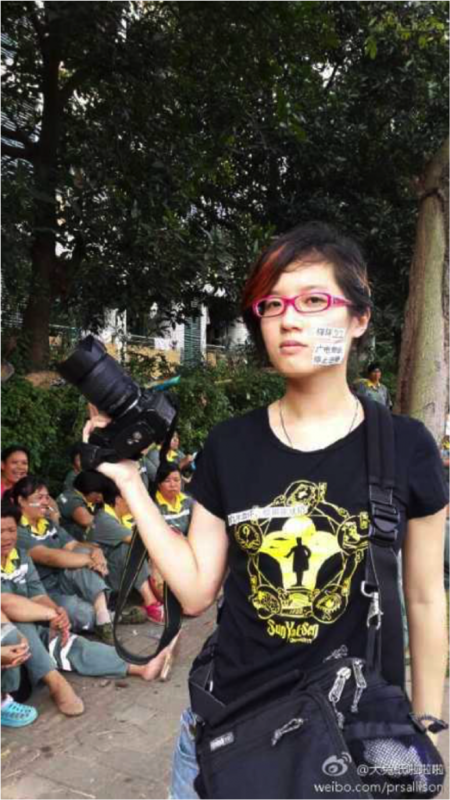 We are deeply concerned about her well-being and strongly protest the illegal actions of the Beijing police. The Beijing police should strictly follow legal procedures to act under "Rule of Law". No insult, no accusation without evidence. No extended interrogation. No extraction of confession by torture. Strictly observe her legal procedural rights including rights to meet lawyers and rights to take medical treatment. Ensure the protection of basic human rights. No secret detention. Conduct fair trial in public. Guarantee her rights and opportunity to defend herself. Judgement should be made according to law. The administration of SYSU should follow the founding ideas of Mr. Sun Yat-sen, support our alumna Zheng Churan, coordinate with other parties and make contributions to solve the issue properly. "The creation of our university is for the glory of the nation." In the current society with prevalent discrimination against and objectification of women, the efforts of Zheng Churan and her friends reflect a positive force and a direction for social progress. SYSU should take pride in producing such an ambitious and passionate student. "Whoever runs counter to the mighty will of world trends will perish." All causes of social justice, despite the always bumpy process, will eventually succeed. Difficulty is the midwife of greatness. We wish Zheng Churan and her friends peace and wellness. They will be back! to add your name and support this cause.